Everyone has faith in something…usually the thing that they worship. For Christians, we have faith in and worship God. For naturalists, they have faith that nature emerged from an aggregate of random mistakes…and they tend to worship some aspect of creation (as is predicted in Romans 1). One of the most common attacks on Christianity is to ridicule its reliance on faith. Atheists proudly proclaim their dependence upon reason or logic whereas Christians practice a faith in a magic book trusting their imaginary friend named Jesus. This tactic has proven very effective damaging the faith of many and keeping others from ever coming to Christ. In my last post, I stated that it is impossible to escape faith while seeking to discern truth. Indeed, everyone practices faith. It is impossible to live and not have faith. Because evidence is interpreted within one’s worldview, evidence that corroborates scripture will never be accepted by the naturalist. They will always interpret evidence from a naturalistic worldview. So, to faithfully present the gospel of Jesus, the apologist should critically analyze the skeptic’s worldview (or presuppositions). All worldviews that do not begin with the Creator as the omniscient Revealer, will end up with contradictions or unfounded regressions. Praise God for his faithfulness and goodness! Point: Some Christians engage in apologetics in a piecemeal fashion. They give evidence here and there. They refute an objection here and there. 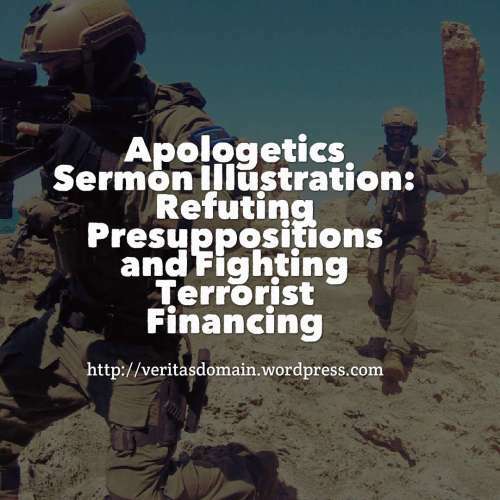 They might not realize the importance of Presuppositional apologetics (as taught by Cornelius Van Til) with its emphasis of going beyond the individual sparring of the skeptics’ objection and instead pursue refutations of the opponent’s worldview at the level of presuppositions. How can you illustrate the importance of refuting an opponent’s worldview?